The New York Yankees have gotten off to an MLB-best 42-19 start in 2018 as they welcome another division-leading club, the Washington Nationals, to the Bronx for a two-game set (6:30 PM on YES). In the midst of the Bombers' blistering run through the first half of the season, several marquee players are at or near the top of the latest All-Star Game voting totals, which were unveiled Tuesday. 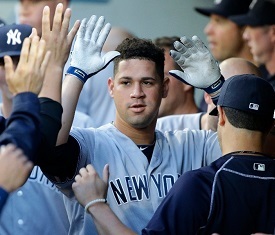 Gary Sanchez is the only Yankee currently leading his position in votes, however other superstars like Aaron Judge and Giancarlo Stanton have already collected hundreds of thousands of votes as they vie for a spot in the AL's starting lineup for the Midsummer Classic. Check out the fully updated lists below after Tuesday's latest updates and continue to cast votes for your favorite Yankees at the link here.